Who is this makeup suitable for? This foundation is suitable for all skin types and is ideal for normal to dry skin.You can achieve variable coverage from sheer through to full makeup. Its compact size and design makes it convenient to take with you when you are out and about, travelling or on holiday. What is the best way to apply this makeup? Prepare your skin by using a cleanser, toner and moisturiser. For some women, particularly with more mature skin, using a primer such as Moisture Mist Pre-Makeup Cream SPF18 can help to minimise pores and achieve a smoother, long-lasting finish. You can apply the stick foundation directly onto the face forehead, cheeks, chin and nose. Use a makeup sponge or clean fingers to blend. Another option is to use a makeup sponge directly onto the stick foundation, then dab and blend it onto your face. Either way, the key is to blend and gradually build up the makeup coverage. From a sheer daytime look through to a full coverage evening makeup, this foundation is easy to blend. It gives the skin a natural and dewy finish. To apply the finishing touches to your makeup and give it that flawless finish, use Moisture Mist Pressed Powder. Apply this with a powder brush to your forehead, nose and chin. This will set your makeup so that it stays on longer, minimises any shine and you will look fresher. This makeup, when applied well, gives you a natural but polished, professional look. 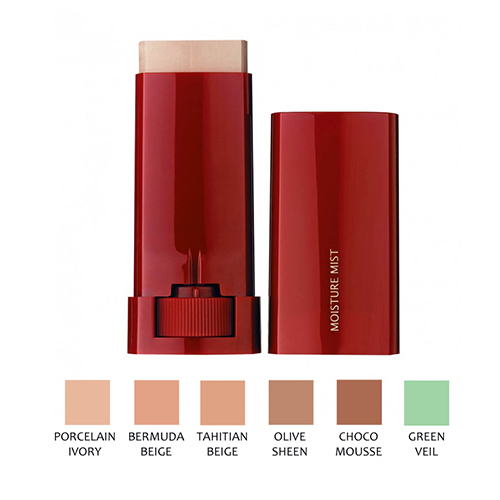 Moisture Mist Stick Foundation is available in 5 shades at our online store www.pharmacysales.co.nz and also in our bricks and mortar store Harts Pharmacy, Warkworth. Our friendly, experienced staff can help you choose a shade that suits your skin tone. If this foundation is not suitable for you, we have other makeup options for you to try. Pop in to see us or phone 09 425-8344 to book a makeup and skincare consultation with our staff.